SuperCap specs and step-up circuit to deliver 9V from a 2.3V SuperCap. I am thinking about using these in my microRC car / TV camera work to ensure a continuous supply of power from the floor/cieling power pickups. Alexandra Silverthorne from "Solarize This" reviews the Interace show at Fraser Gallery. "Blame" didn't seem to be a hit, but she liked "Look"
Geek Fashion Show, including a hoodie with a wireless heart monitor and an embedded camera that snaps pictures as a wearer's heart rate increases; and the gown, fitted with a hacked hand vacuum and a series of valves, that inflates and deflates according to the desired silhouette. If you like that, you might also dig SWITCH, a Do It Yourself show for creating fun and fashionable items with electronics. I lucked out when mounting the Saturn windshield wiper motor from BG Micro for "Blame" using 3.5 inch U-bolts. So of course today I find a link to everything you need to know about this motor, including a bunch of great ways to mount it. Here is the Sycophant Movie in Windows Media format, filmed this summer but not edited until today. The "Interface" group technological art show opened last Friday night at Fraser Gallery Bethesda. 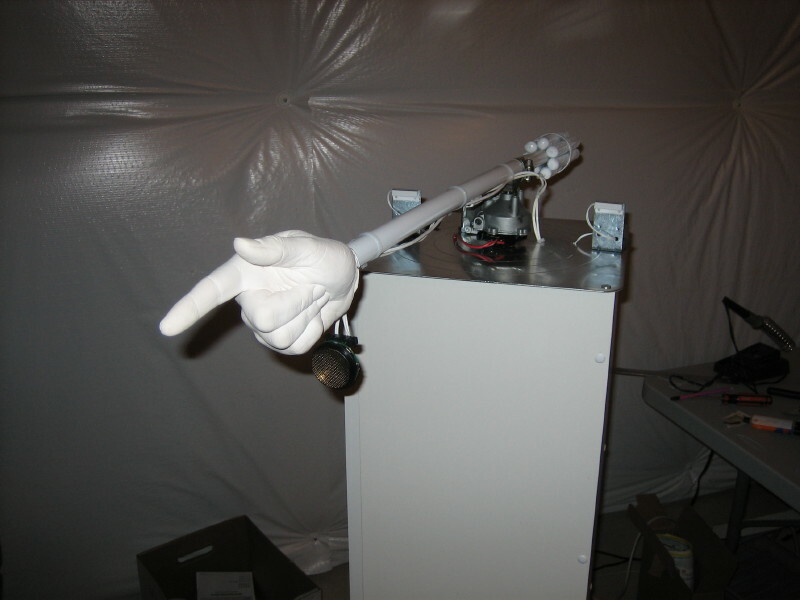 My other work, "Blame" is a robotic arm with a pointing hand that scans back and forth, and when it finds a viewer (with an ultrasonic proximity sensor), it stops and accuses them of some horrible societal issue. Here is Quicktime video of "Blame". I was very inspired by Claire Watkins' magnet work. I have been reading up about rare earth magnets. I think it would be cool to combine powerful permanent magnets with electromagnetic coils driven by modulated current, perhaps from some kind of sensor to provide an even more interactive work. Philip Kohn's psychadelic time and space shifting mirrors were excellent as well! Here are the three boards of "Blame." The biggest one (left) has the PIC microcontroller, DTMF decoder chip, and relays. The lower right hand board is an MP3 player, and the upper right hand board is the DC motor controller board. Here is a sneak preview of the completed "Blame." 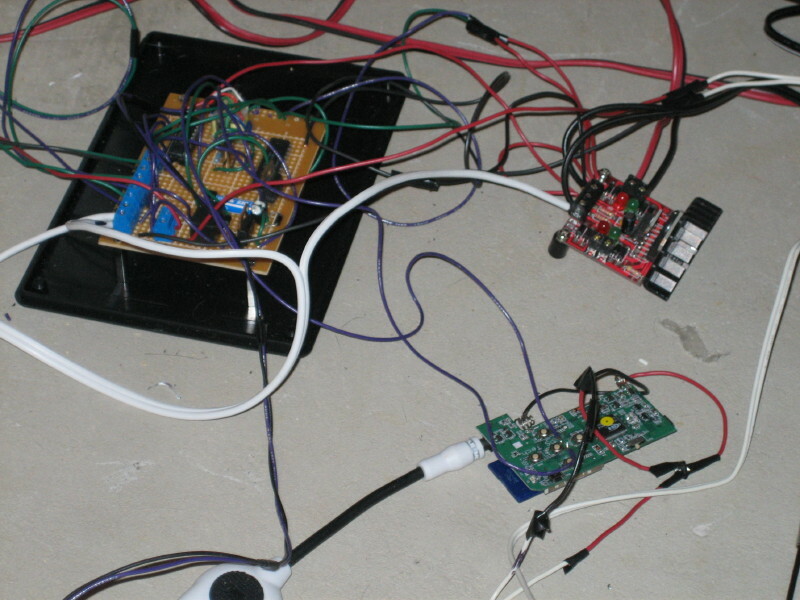 The ultrasonic proximity detector is under the hand, and on either side of the arm motor are magnetic reed switches (used in home security on windows and such).